This study investigates the Black Sea influence on the thermal characteristics of its western hinterland based on satellite imagery acquired by the Moderate Resolution Imaging Spectroradiometer (MODIS). The marine impact on the land surface temperature (LST) values is detected at daily, seasonal and annual time scales, and a strong linkage with the land cover is demonstrated. The remote sensing products used within the study supply LST data with complete areal coverage during clear sky conditions at 1-km spatial resolution, which is appropriate for climate studies. The sea influence is significant up to 4–5 km, by daytime, while the nighttime influence is very strong in the first 1–2 km, and it gradually decreases westward. Excepting the winter, the daytime temperature increases towards the plateau with the distance from the sea, e.g. with a gradient of 0.9 °C/km in the first 5 km in spring or with 0.7 °C/km in summer. By nighttime, the sea water usually remains warmer than the contiguous land triggering higher LST values in the immediate proximity of the coastline in all seasons, e.g. mean summer LST is 19.0 °C for the 1-km buffer, 16.6 °C for the 5-km buffer and 16.0 °C for the 10-km buffer. The results confirm a strong relationship between the land cover and thermal regime in the western hinterland of the Black Sea coast. 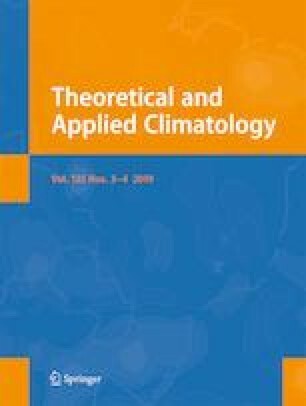 The satellite-derived LST and air temperature values recorded at the meteorological stations are highly correlated for similar locations, but the marine influence propagates differently, pledging for distinct analysis. Identified anomalies in the general observed trends are investigated in correlation with sea surface temperature dynamics in the coastal area. The MOD11A1 data products were retrieved from the online Data Pool, courtesy of the NASA Land Processes Distributed Active Archive Center (LP DAAC), USGS/Earth Resources Observation and Science (EROS) Center, Sioux Falls, South Dakota, https://lpdaac.usgs.gov/data_access/data_pool; accessed on March 2015. Source of SST remote sensing information: NASA Goddard Space Flight Center, Ocean Ecology Laboratory, Ocean Biology Processing Group; accessed on November 2016 through NASA Ocean Biology Distributed Active Archive Center (OB.DAAC), Goddard Space Flight Center, Greenbelt MD. Digital Elevation Model and Corine Land Cover 2006 seamless vector data produced using Copernicus data and information funded by the European Union and distributed by the European Environment Agency (EEA). The air temperatures were retrieved from the Integrated Surface Global (ISD) Hourly Data, a digital dataset DSI-3505, archived at the National Climatic Data Center (NCDC) and available at https://www.ncdc.noaa.gov/isd. This work was supported also by the Research Institute of the University of Bucharest (ICUB) fellowship for young researchers. We would like to thank the three anonymous reviewers for their very useful comments and suggestions.